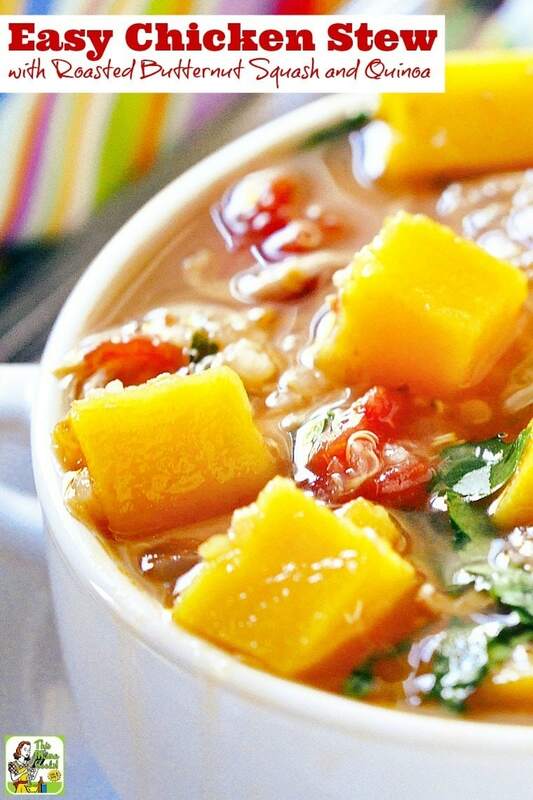 I crave chicken recipes like Easy Chicken Stew with Roasted Butternut Squash and Quinoa when the weather turns yucky. This chicken stew recipe is from my friend and frequent contributor Holly Clegg. It’s a one-pot, diabetic-friendly chicken soup recipe full of fantastic and hearty flavors. Make this chicken stew recipe from scratch tonight for dinner or for a soup-er bowl party! You can find this easy chicken stew recipe in Holly’s wonderful trim&TERRIFIC Eating Well to Fight Arthritis cookbook. This delicious and simple chicken stew recipe is ideal for anyone who’s on an arthritis diet as it can help to reduce inflammation. 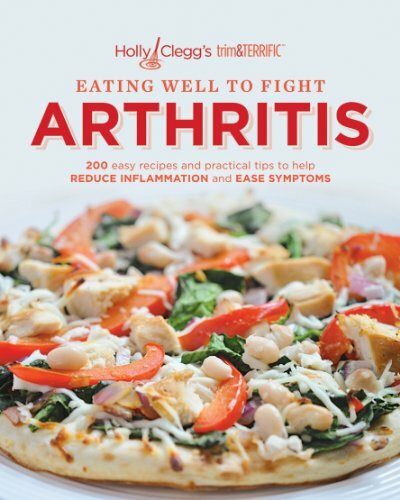 If you or a family member is on any kind of anti-inflammatory diet, whether for arthritis or another health issue, you’ll want to check out Holly’s trim&TERRIFIC Eating Well to Fight Arthritis cookbook. While Holly specializes in diabetic and anti-inflammatory recipes, all of her recipes are delicious enough for the whole family – just like this Easy Chicken Stew with Roasted Butternut Squash and Quinoa recipe! 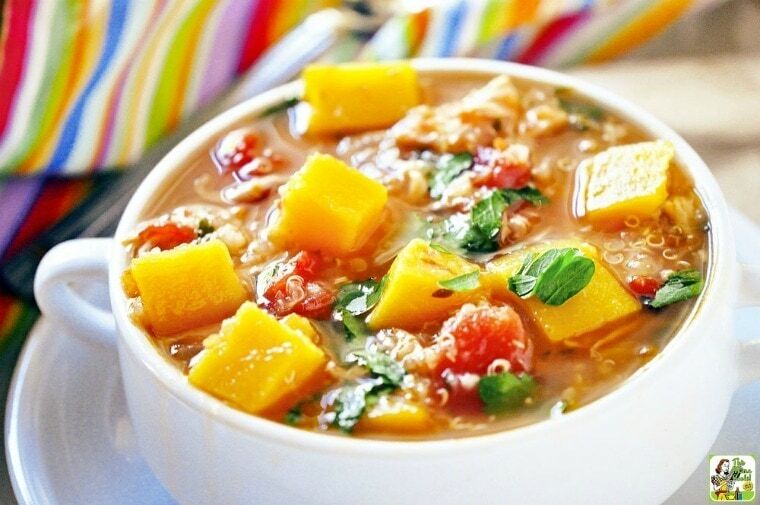 Healthy chicken stew recipes make delicious souper suppers! This time of year, warm and inviting pots of soups and stews are often found simmering on the stove. One-pot soups are winter-wonderful, especially if you are feeding a soup-er bowl party crowd – you are sure to please with these winning one-pot meals. 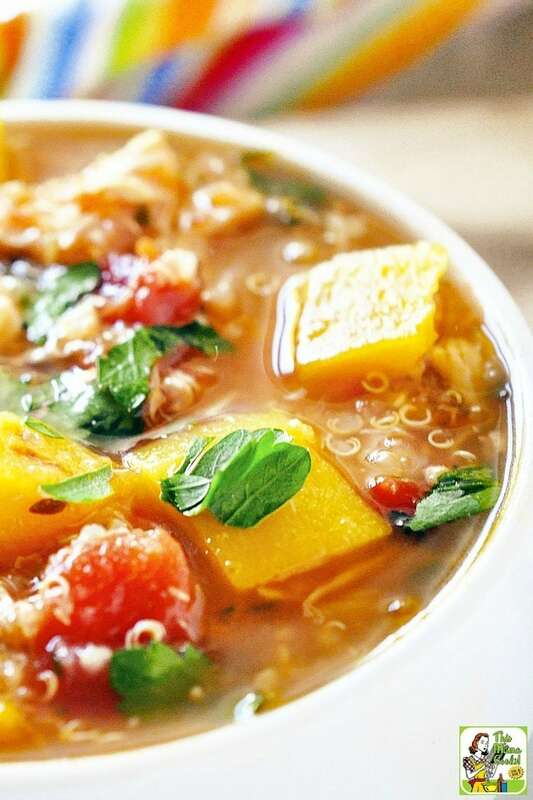 Chicken Stew with Roasted Butternut Squash and Quinoa is an excellent healthy chicken soup recipe that sounds more complicated, but is actually very easy. Roasting the squash is worth it as it brings out the buttery sweet flavor. And these days you can find pre-washed pre-cut squash, which saves you lots of time and effort. Using rotisserie chicken, pre-cut butternut squash, and a few pantry staples this hearty soup basically cooks itself. If you aren’t familiar with quinoa, then you should definitely give it a try as it’s readily available in most grocery stores. Although it’s usually thought of as a whole grain, it’s actually a seed and considered a complete protein, making it a wholesome addition to this delicious, gluten-free, diabetic-friendly easy chicken stew recipe. I hope you serve yourself a cup of my delicious diabetic chicken stew recipe and cozy up to keep it easy and warm you up on these colder days. Preheat oven 400°F. Line baking pan with foil and coat with nonstick cooking spray. Spread squash on prepared pan and roast squash 20-25 minutes or until tender and starting to brown. Meanwhile, in large nonstick pot coated with nonstick cooking spray, sauté onion and garlic about 5 minutes; until tender. Add tomatoes, broth, squash, oregano and quinoa. Bring to boil, lower heat and cover, cooking 15 minutes, or until quinoa turns translucent. Add chicken and parsley, heat a few minutes. Recipe and photograph used with permission of author.